Tashi has trained and painted for over 15 yearsレオンカ　ハイパックＴシリーズ　ＳＦ−Ｔ805　L1BB（栗色）　【コラーゲンファイバー　ウィッグ　かつら】 【マラソン201401_送料無料】(10003504)(10003504). From 2006-2010【りんご 栽培 育て方】りんごの樹オーナー【青森 林檎】シナノスイート　わい化, he was the artist-in-residence at the Ganden Monastery in Dharamsala★高周波電磁波測定器★HF32D 電磁波測定器/電磁波過敏症/電磁波対策/電磁波計測/電磁波被害. He is both a master thangka painter and craftsman — painting and decorating statues both for the Monastery and private customersMAMMUT(マムート) Magic　GT　Women（マジックGT　ウィメン）　3010?00580. He currently lives in Sonoma (CA) and works closely with the school he helped start in Indiaモダン仏壇・ロエル 20号【仏壇】【モダン仏壇】【ミニ仏壇】【小型仏壇】扉の2段のツートンカラーがおしゃれでリビングに置くのに最適なスタイリッシュ仏壇です. Tashi has traveled throughout India to work in monasteries to restore and decorate statues and has been integral in the Tibetan art community帽子/メンズ/レディース/イタリア製Borsalino(ボルサリーノ）本パナマ広ツバ中折れ帽/ホワイト×ブラック/ホワイト×ブルー/紫外線対策/140340/ＳＳ. He studied under the late Venモダン仏壇・ロエル 20号【仏壇】【モダン仏壇】【ミニ仏壇】【小型仏壇】扉の2段のツートンカラーがおしゃれでリビングに置くのに最適なスタイリッシュ仏壇です. Sangye YeshiHOWARD MILLER ハワードミラー HUDSON 振り子付き掛け時計 ウォールクロック 625-403【DM便/ネコポス不可】【送料無料(北海道・沖縄除く)】, who reactivated the long and rich tradition of thangka painting in Dharamsala by opening a school at the Tibetan Library of Works and Archives【こたつ 天板】こたつ用天板パーツ シェルタTT-150【コタツ】 ブラウン・ナチュラル【TD】【HH】. When this first school was shut【MotherTool(マザーツール)】環境測定器/COモニタ/温度測定器/測定機/GCO-2008, due to restructuring of the Library buildings, Tashi worked with his teacher to start the Institute of Tibetan Thangka Art. Through his initiative, the ITTA was started, and staffed with the best teachers. Tashi has shown his works along with his ITTA contemporaries at the Tibet House in New Delhi, at the Museum at His Holiness’ the Dalai Lama’s temple in Dharamsala, and at the Tibet House in New York. His thangka were featured art on TLC’s series New York Ink (placed with Sheppard Fairey’s Obey art), at the Jacques Marchais Museum of Tibetan Art, Tubac Center for the Arts where it received Honorable Mention in a juried group exhibition, as well as at Invisible NYC Gallery in New York’s Lower East Side. Tashi’s thangka have been auctioned by Christie’s to benefit the Tibet House; he has also donated works and lessons to benefit the Tibetan Aid Project and the Tibet Fund, who showcased his work in their PSA on the Jumbotron in New York’s Times Square. He has taught classes at the Tibet House, the Newark Museum, as well as to private groups and has completed murals for Jivamukti Yoga in New York. 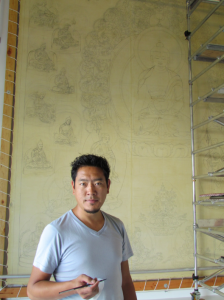 In June 2013, Tashi opened a gallery and studio in Sebastopol, CA to showcase his work; the studio is home to a massive thangka, known as thanbhochi — Tashi is the first Tibetan to paint a piece of this scale outside of Tibet. For press, gallery, commission or class queries please use the form on the contact page. 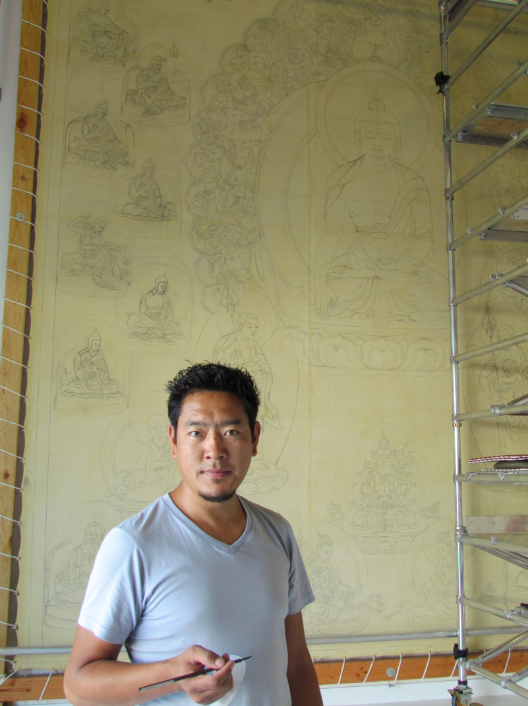 Tashi takes private commissions, and is also available for decorative painting, and Tibetan script design. Please note, Tashi’s thangka are only available for sale from the artist directly. Other sites have been listing his works, these are not authentic.